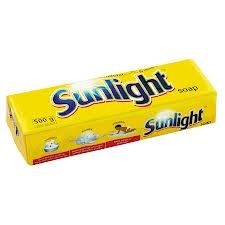 Sunlight is a brand of household soap originally produced by the British company Lever Brothers in 1884. It was the world's first packaged, branded laundry soap. Designed for washing clothes and general household use, the success of the product led to the name for the company's village for its workers, Port Sunlight. The soap formula was invented by a Bolton chemist named William Hough Watson, who also became an early business partner. Watson's process created a new soap, using glycerin and vegetable oils such as palm oil rather than tallow (animal fats). William Lever and his brother James Darcy Lever invested in Watson's soap invention and its initial success came from offering bars of cut, wrapped, and branded soap in his father's grocery shop. Prior to this, commercially made soap was bought in long bars, an early labour-saving device for the housewife.